There are many things I’m just never going to connect with in a truly direct way, and plenty more things I will never come close to understanding at all. I’m, frankly, too old. That’s not meant as some “lolz oldz get out the way” sort of thing, but rather an acknowledgement that certain things just hit harder for younger people. I’ve lived through too much, and the things that stir me up are not the same things that will hit someone five, ten, fifteen and so on years younger than me. I can hear a song about teenage pain and feel something, but it’s just an echo of the past. For someone else, that pain is direct, real and now. This has always been the tension I personally feel with the music of Fuji Chao, and it feels even more prevalent listening to The Virgin, her most complete and compelling work yet. Part of that praise comes from a musical place. The music the bedroom producer has put out thus far have either been has either been sets of sketches featuring her near-whispered voice, or collections veering closer to beat tapes. 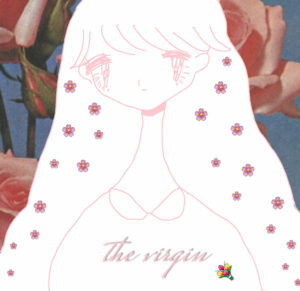 The Virgin builds a bridge between the two approaches, resulting in swift instrumental numbers featuring a few mumbled words, slow-burning techno tracks with anime samples piercing through them, and “Secret,” a muffled number that bursts into thumping pop. This is a young artist exploring new musical territory, trying out a lot of different noises and seeing how she can fit in them. Musically, this is already her most compelling release. Yet what makes The Virgin an album I’ve been revisiting again and again over the last week is the direct emotion in every number. This isn’t a new development for Fuji Chao, whose earlier albums felt like journal entries from young adulthood and all the pain that comes with that. But The Virgin goes even further. Songs such as “Fallen Angel” and the title track still feature spoken word vocals reminiscent of “poem core” artists, delivered in a quiet, feels-like-a-secret manner. Yet then there are the moments of more violent outbursts — the crying and apologizing of “Shoujo ver. 2,” the extremely uncomfortable samples anchoring “Raaka.” Right in the middle is “Rose Quartz,” a five-minute sound collage featuring one of the niftiest mid-song flips around, built entirely from dialogue taken from the TV show Steven Universe. And it’s moments like that which make me realize I’ll never really get the emotions at the center of The Virgin, as it’s an album built from pieces of teen-life in the 2010’s and features the life-or-death feelings you can only really experience when you are still young enough to make them feel so dramatic. I think anyone can listen to this album and come away enjoying it, or being like me and penciling it in for a top-ten spot later this year. But I also know the way it hits me is not nearly as strong as it could be. And that reminds me that, for someone, it hits really, really hard. Get it here or listen below.